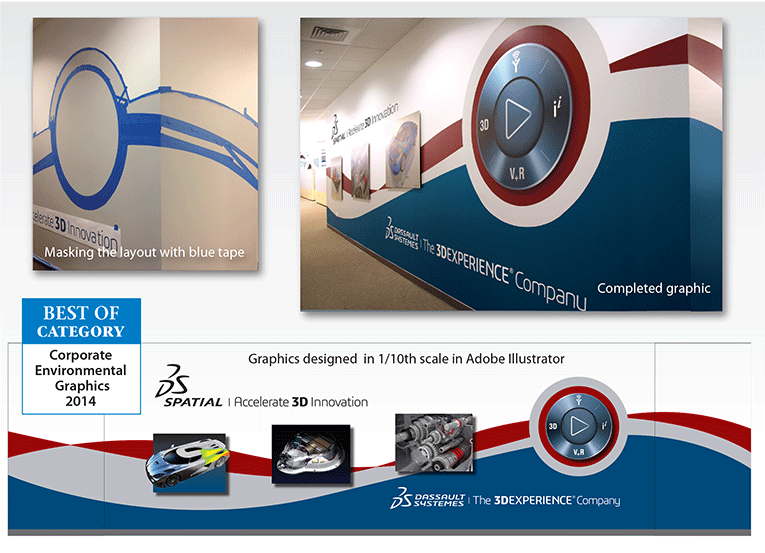 This graphic was designed for the office headquarter’s interior wall that was 110-feet including the 2 ends that wrapped around for visual flow. I designed it in Adobe Illustrator at 1/10 scale. I then transferred the graphics to wall in pencil. I then hand masked the red and blue stripes for the painters who worked during at night so as to not block this critical hallway. White laser-cut lettering was added as where 4 computer graphics that were printed on brushed aluminum and then mounted onto a small wall coupling where they floated away from the wall around 3/4 of an inch that helped with the illusion that they were riding the wave. These mechanisms also allowed easier updating of these graphic pictures as desired.